1982 Theirry Gervais from Bayonne in France began construction of his 42 foot sailing boat "Tamata Nota". This boat has a steel hull similar to the famous "Joshua" which belonged to the famous sailor and philosopher Bernard Moitessier. Since then Theirry has sailed with his family from the Atlantic coast of France, through the Mediterranean to Greece. They soon fell in love with the seas and islands of this beautiful country. In 1999 Theirry began to paint watercolour pictures of the places he visited. In the main these pictures were inspired by the local maritime life. 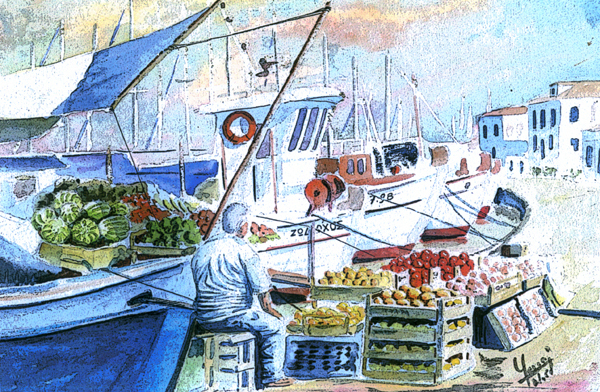 Paintings of shipyards,harbours and all kinds of sailing and fishing boats. He was often commissioned to paint for the owners of boats in many of the harbours he visited. The Gervais boat is over - wintered in the Aya Kiriaki shipyard and returns each summer to the Aegean for another season of sailing and painting tours. 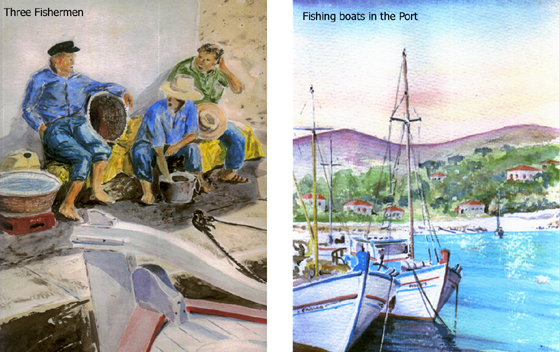 Thierry Gervais's paintings were on display in August 2009 during an exhibition called "BOAT LIFE IN GREECE" at the Alonissos museum in Patitiri.